My requirements are relatively simple. It must support getting a car under 3200 lb to and from race tracks including a reasonable list of tools and supplies. I set the car weight at nominal 3200 lb as both the Mini and the Porsche are either under or roughly at this number. 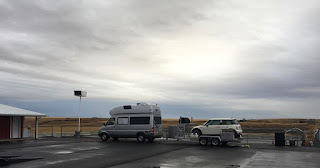 I have no disillusion that at roughly 5000 lb for a loaded trailer Brunnhilde would need to be driven sensibly on the highway, and that negotiating hills will tax most driver's temperament. I well expected this and I do not see the reason to replace Brunnhilde with a more tow capable vehicle. Tallying up the itemized weights above arrives at 3957 lb of trailer pay load. The advertised base trailer weight of the Trailex 8045 is 900 lb. This give a total laden trailer weight of 4857 lb. Adding the optional tire rack and we are right at 5000 lb max tow limit. The number is awfully tight but thankfully the numbers I listed are conservative estimates. Staying within the 500 lb tongue weight is another challenge as it hinges on the design of the trailer with respect to the car in question. There are some leeway to control the tongue weight by locating the car, and to lesser extend the placement of the trailer accessories. As I want to equip it with a winch in case of need, I chose a manual one to avoid adding a battery, and to keep things simple and with negligible added weight. 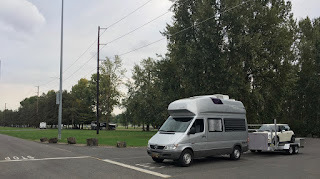 I have taken two trips to the high country in Central Orgon's race track, one trip with the Mini and the other with the Porsche. I learnt to judge the trailer tongue weight by the way the suspensions of the tandem wheels of the trailer look, and the attitude of the trailer bed. I also pay attention to the squatting of Burnnhilde's rear suspension. I used no scale to check the tongue weight. I planned on during the return trip to stop by a ODOT's truck weighting station to obtain the actual numbers. 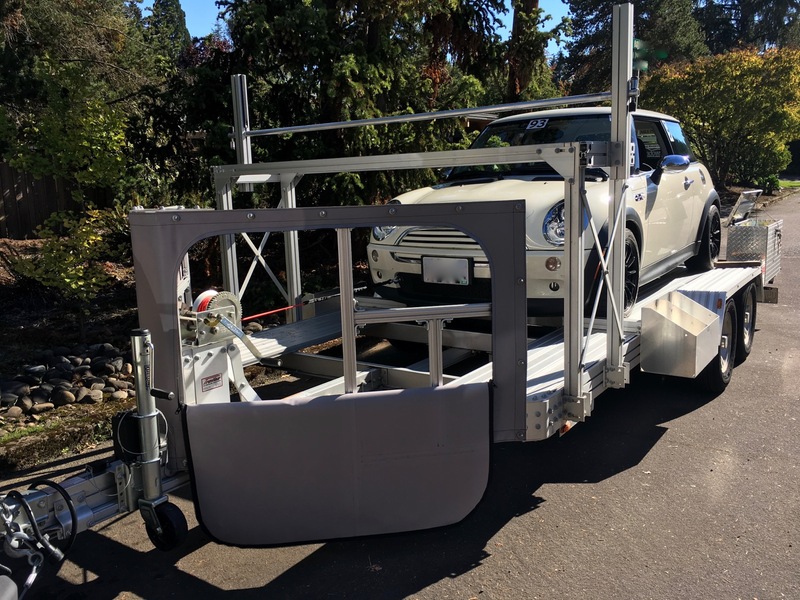 For what is worth, I know the Mini actual weight is about 2800 lb, and the Porsche's 3150 lb so I knew the tow limit would not be exceeded before taking the trip. The originally 2-inch drop Curt trailer 2" ball mount I chose is perfect once I flip it upside down to give a 2 1/2 inch of rise to keep the trailer nearly perfectly level when loaded. Here are the numbers taken from the ODOT weight station, with the trailer hitched to Brunnhilde. In both trip the fuel tank of the towed cars were near empty. With these number it is quite easy to cross check and arrive at the tongue weight knowing the nominal weight of Brunnhilde alone. I know it is almost exactly at 8000 lb give or take 100 lb as I had weighted it many times. 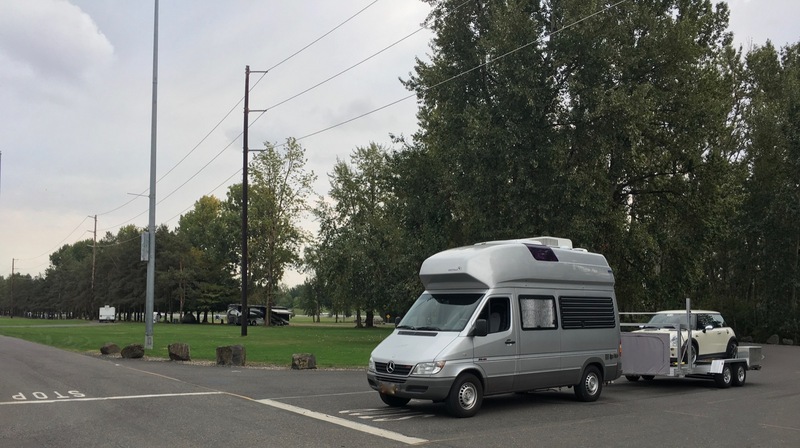 The important cross check is summing the front and the rear axle weight one should arrive at the weight of the entire motorhome = 3450 + 4750 = 8200 lb. This happens to be just 50 lb less than the whole motor home weight of 8250 lb, giving 50 lb of scale anomaly. It is reasonable to arrive at the tongue weight of between 200 to 250 lb. It is just about optimum. This is consistent with the observation that Brunnhilde has no visible rear end squat. 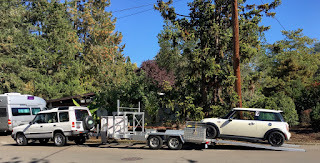 As for the trailer it is well within the trailer's and Brunnhilde's tow limit came in at just 3900 lb. Similarly the same exercise was carried out with the Porsche in another trip but without a set of spare wheels. Inspecting the numbers one can see the Porsche is about 200 lb heavier than the Mini which is consistent. 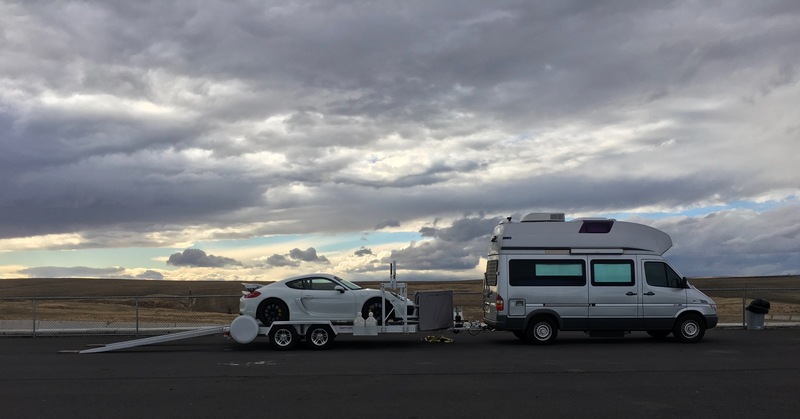 The front axle and rear axle's sum gives exactly 8150 lb of the total motorhome weight. Again the trailer weight is well within the limit at just 4100 lb. This comfortably leave about 500 lb of unused trailer payload capacity for fuel and a set of spare wheels. The tongue weight is approximately 150 to 200 lb. With a set of spare wheel it is nearly exactly right but may require loading the Porsche slightly more aft on the trailer. To reconcile the difference of 8250 lb versus 8150 lb of the motorhome weight of the two trips I identified two things being different in the two trips. In the first trip with the Mini there were the Honda generator by the driver's seat and a eBike on the upper berth. Both these accounts for roughly 110 lb difference. I am extremely happy to see all the numbers add up and passed cross checking. So how well does Brunnhilde cope with towing the trailer loaded? To this question there is no better than these trips to the Central Oregon racing park. It rises 2200 feet above sea level in 35 miles. 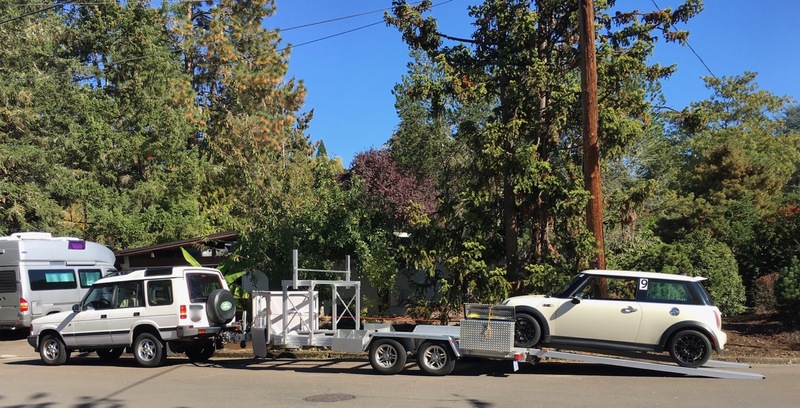 As long as one drive with temperament and caution towing is not a problem if you select the necessary lower gear when pulling grades. It is like driving a fully laden big rig tractor trailer. With the laden trailer in tow Brunnhilde becomes a 40-foot road train with an aggregate weight of over 12,500 pounds. That is a lot to ask from a 5-cylinder turbo diesel drivetrain. The Takonsha P3 electric brake controller function so well that I seldom think of its existence. One characteristic of the trailer electric brake is it tend to crab very hard when cold and damp. This typically when you first get on the way. I think it is just the nature of how the drum brake is actuated by the mechanical force amplifier that formed by the magnet dragging along the inside face of the brake drum. So far not once did I feel that I need to use the manual brake lever. In all the trailer prep work was a resounding success. The LED lighting on the Trailex is very well thought out and executed. They are very bright even in daylight. Good lighting on the trailer to me is a very important safety consideration as you want the trailer to be as visible as possible to other drivers. Loading a car with very little ground clearance one can appreciate the 11-foot light weight ramps. Their generous width afford driving the car up and down the trailer with little drama once you get use to the process. With the long front end overhang on the GT4 the front splitter lip barely kisses the ramps when first approach them. To solve this I add a pair of 14" long of 2x12 scrap planks. I cannot image the problem with much shorter ramps on all other trailers.